Are the people in the car just mocking the gas station attendant because he has to stand out there in the rain? Seems like kind of a mean-spirited illustration if they are. Is the magazine’s cover date somehow relevant? I think he is saying he just wants one gallon of gas, meaning the poor schlub has to give him full service in the rain for probably 15 cents of business. And they seem awfully happy about it, too. Yeah, mean-spirited. Or maybe one dollar worth? Minimum wage was $0.30, gas was $0.20/gal, so a buck would be OK. At the end of the Depression, that wouldn’t have been a bad sale, I imagine. So maybe the pump jockey just hasn’t had a chance to react yet, was standing in the rain feeling miserable and is about to be happy? I think it’s just supposed to be a slice of life. A bit hard to wrap our heads around cause the attendant does look miserable and misery should only be used in humor are real news on covers. But I still think it’s just a slice of life. Car seems a little old fashioned for 1939. Back in the days of general interest magazines, mildly humorous/wistful cover paintings were all over the place. If any are remembered at all, they’re the ones Norman Rockwell did for Saturday Evening Post because they were reprinted in books and elsewhere. MAD Magazine would do broader jokes, of course. But most of the Alfred E. Newman gags were painted in the “real magazine” style by Norman Mingo. 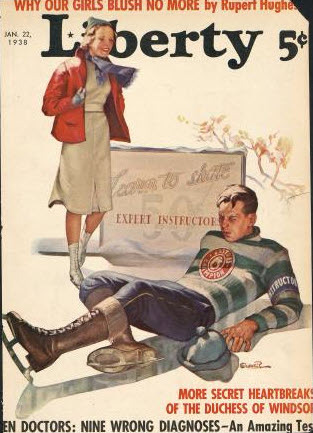 In its brief glory days, National Lampoon parodied the fast-disappearing genre by applying a mock Rockwell style to rougher gags: A scolding customs inspector holds up naughty underwear from a prim woman’s luggage; terrified runners sprint with a diesel truck filling the page behind them; an old-fashioned paperboy on his bike throws newspapers that appear to be exploding as they hit the porches. New Yorker, Judge, and the original Life favored cover art that was more emphatically art, usually in a cartoonist’s identifiable style. With the Liberty mag cover, I think the artist was trying to show the happy couple heading off on a sunny holiday with their five gallons of petrol, leaving the attendant at home in the rain. Their faces already seem lit by the sun of another place, plus they’re in a sunny yellow car, whereas his face is flat lit and greyish, as indeed is his work station. Perhaps inside there is a story about summer holidays/ Easter breaks/ heading for the sun. Oddly, it reminds me of seeing the Beach Boys at Knebworth in 1980 (a one-day outdoor festival UK, also with Santana and Lindisfarne and Mike Oldfield)… Apparently the last time all the original Beach Boys lineup performed live together (https://www.youtube.com/watch?v=0ty9UqueoA8). We were out in a damp field in England in 1980 being rained on, whereas they were lit up as if in sunny 1960s California seen through a time portal. The surreality had been ramped up earlier as at sunset (with some actual sun before the rain came) we were buzzed by a WW2 B-17 bomber. I was hopin’ the stories were at that link, but it’s only tables of contents. Another article about ‘The Duke of Windsor talks War and Peace’ looked interesting. I saw it as “you should get a roof over your head, like we have. The joke is still at the working-man’s plight, but not really “mean-spirited” or “mocking” to me. Thing is, a man can look at this cover and see himself in either role, depending on recent events. Kind of a “some days you’re the dragonfly, and some days you’re the windshield” type of thing. My own university library does not subscribe to that particular service, or I’d grab it for you. When I was working and had a work computer, I could’ve gotten this. And not had time to read it. Now I have the time, but no access. Isn’t that just the way? I think James might have gotten it. Oh, I know, I was just being snarky/teasing. I’ve only read a little about the Duke of Windsor, but “The Crown” certainly slams him around a lot. In 1938 his views on war and peace would have been immensely problematic. The automobile the couple are in is an Edison SparkFlyer, one of the earliest EVs. The chap in the driver seat is flipping the poor attendant off, as if to say “We don’t need your carbon-spewing fossil-fuels, Goober. Our batteries are fully charged to take us a full 10 kilometers before we’ll need to get out in that rain!” Only there won’t be any charging infrastructure for another 75 years. April Fool! I’m more interested in the “nine out ten doctors” story. Clickbait from 1938? Yes, which is why I’d like to read the story. I read two biographies of the Duchess of Windsor last year, which were written in retrospect; I would like to read some original source material, of the time, so to speak. I think it refers to that old April Fool joke where you pull up to a “service station” in the rain and pretend you want gas. When that gullible old fool walks out in the rain – “April Fool!” The driver is pointing up to direct the reader’s eyes to the date, April 1. The tires are bald. Not good in rain.